offer a superlative product for both men and women, and are available plano (without prescription lenses), or "RXable" (made with your prescription). Yes, it is a luxury to be able to build a pair of Oakley sunglasses with the specific Oakley-made lens type and color, together with your own prescription. But that potential is just another feature in a long history of Oakley Sunglasses — delivering potential to people who can then produce accomplishments that nobody thought possible. To be truly "disruptive" in the Oakley sense means that you start with the rest of the pack but then branch out and seek a new way, which then makes you a leader for people to follow, and thereby changing the course of history. The history of Oakley sunglasses is exactly that — disruptive. There are many new models of Oakley sunglasses, but who doesn't love the old favorites? 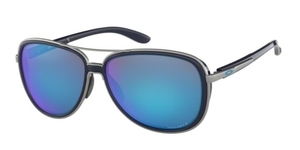 The Oakley Square Wire sunglasses, and The Oakley Half Jacket sunglasses, are two of the most successful Oakley sunglasses models every produced. Why change? Change can be good, and so there is a huge collection to choose from. On the other hand, "If it ain't broke, don't fix it"